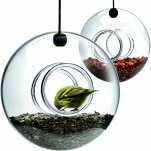 Stylish ball shaped feeders make a great decorative feature as well as feeding trend setter birds! 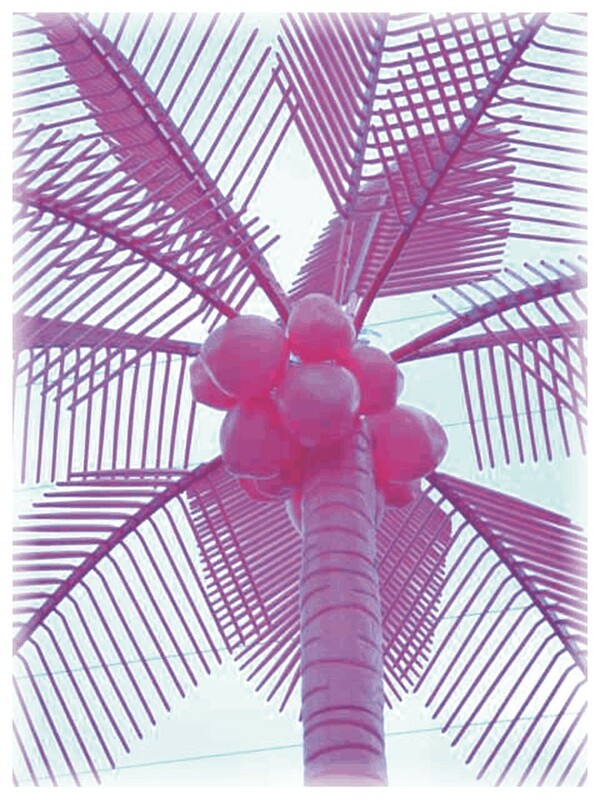 The 'Barbie Pink' palm tree - for the real altrnative Christmas. A 'Rocket Garden' is a box full of baby vegetable and herb plants that is delivered direct to your door. Once delivered all you need to do is plant then in a suitable container. It is so simple that no gardening experience is required. 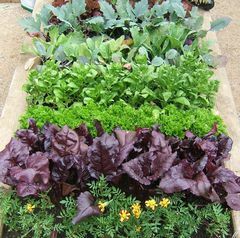 The 'Window Box Garden is great for small spaces where the plants supplied will supply and amazing amount of fresh produce. Other 'Rocket Garden' packs include vegetable, salad and herb versions. www.rocketgardens.co.uk as supply gift vouchers which make great Christmas presents. 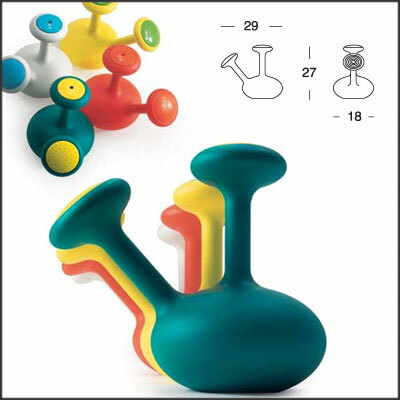 Pipe Dreams - watering plants with style. Jerszy Seymour's colourful two litre watering can in amazing colours. One nozzle has a single hole spout and the other has a watering rose. 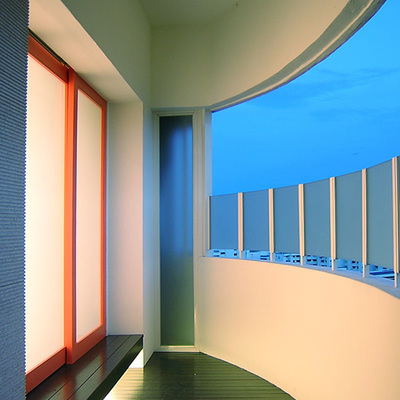 This is the essence of minimalism in a balcony space. Its intention is to simplify everything other than to accomodate its purpose. It has a neutral palette and uses natural materials - stone, wood, steel and glass. Droplet hangers. Perfect hanging planters to link with APTA's Urban Elements planters. Discovered the perfect yardz Christmas tree - a lighted Palm Tree ! All the rage in the USA, they need no decorating, just screw 'em down and plug them in. Available in a great range of colours including 'Barbie' pink. Also available to complete your Christmas festivities are 'electronic fire works'. Large colour stars on thin dark uprights giving an amazing impression of a firework burst - without the noise and danger. Cosmo lighting Inc. have launched a range of new LED Ribbon Lights and LED Bead lights. The main feature of these lights is the low power consumption and low heat output. They are great for daily living applications, plants,etc. as well as festival decoration. They are both available in a range of four colours, blue, green, red and amber as well as multicoloured, last for at least 50,000 hours and work over a wide temperature range. These are state of the art, flexible, easy to use and versitile - and not just for Christmas. The Kanpazar light designed by the Spanish designer Jon Santacoloma, is based on the shape of the pine trees that crown the Alto de Kanpazar in his native Spain. 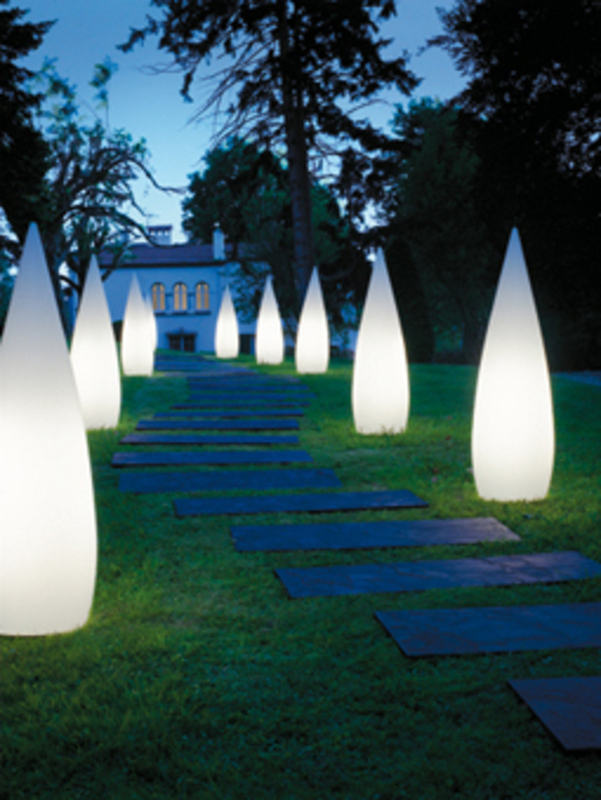 The lights are great for all landscaped outdoor areas but especially small urban spaces. The Kanpazar is manufactured in neutral polyethylene with a flat surface. It is available in three variations - A: secured to the ground, B: portable with 3.5m cable and C: portable with a concrete pot base. It is lit by two 55w flourescent lamps. Due to its luminous and formal characteristics, it is very interesting in minimal setting. The perfect yardz Christmas tree! Ben Dicken uses recycled estate agents signs to create amazing bird boxes. They are lightweight, well insulated..... and even come with a witty estate agents description of the property! The boxes come with screws and a fixing bracket, and instructions for location and attachment.